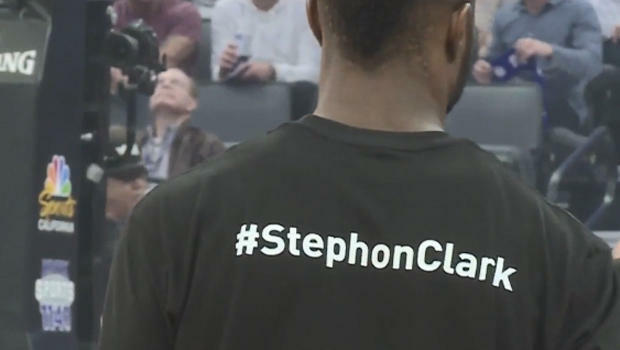 SACRAMENTO, Calif. -- NBA players for both the Sacramento Kings and Boston Celtics made a visible statement Sunday, wearing black T-shirts calling for change in the wake of the police shooting death of Stephon Clark, reports CBS Sacramento. The front side read, "accountability we are one." On the back, "#StephonClark." The players wore the shirts in pregame warmups to honor the memory of the 22-year-old who was unarmed when shot and killed by Sacramento Police. Officers fired 20 times in the darkened back yard of Clark's grandparents. He was holding a cellphone they said they thought was a gun. The shooting sparked protests in the California capital. Players on both teams also participated in a public service video promoting unity while seeking change. The idea for the shirts came from Kings player development staff member, Akachi Okugo, but was put into action by Kings guard Garrett Temple, who's been outspoken from the beginning about police accountability. "It's probably the toughest job in America and I applaud them for putting their lives on the line every night, every day, but with that comes responsibility. That's the mantle that they carry and the burden that they bear," Temple said. Celtics players weighed in as well. "For the family I know it's tough. No gesture can bring your son back, but as NBA players and people of influence, we have to continue to speak up about things," said forward Jaylen Brown. The players' tribute drew both praise and criticism. Responding to the PSA, some on the Kings Twitter page said Clark should have complied with officers' commands. Other fans offered their full support. "We need to let everybody know that we are a team. Whether it's on the court or in the streets, we are all family," said Kings fan, Adriana Diaz. But for players like Temple, it all comes back to police accountability. "That may make police think twice about pulling that trigger if there is a little more consequence for those actions," he said. Celtics coach Brad Stevens was also instrumental in the T-shirt tribute. Stevens says he was inspired by the words of Kings ownership that addressed fans after a recent game against the Atlanta Hawks that was delayed by protesters outside Golden 1 Center. Temple says the NBA had to sign off on the PSA. Players on both teams expressed their appreciation for being a part of a league that allows them to have a voice. The Kings lost to the Celtics, 104 to 93.